I am excited to be heading out tomorrow morning (Thurs 10 June, 2010) for the 41st Annual Southern California Genealogy Jamboree! This post "Jamboree: Getting Into the Spirit" on the Southern California Genealogy Jamboree blog, elevated my excitement even more! Paula Hinkle has done an amazing job, thank you Paula. I did attend last year, it was the first genealogy related event I had ever been to and it was outstanding. I met so many geneabloggers that we usually connect with on-line normally. I can tell you, they are all as wonderful in person as they are in the blogoshpere. The geneablogger presence this year is going to be huge, Thomas over at GeneaBloggers created a list of "Who'll Be At #SCGS10 Jamboree". 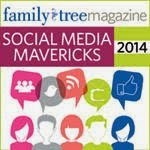 I am very much looking forward to meeting new bloggers and can't wait to see my blogging friends I met last year. Left to Right: Randy Seaver at Genea-musings, Craig Manson at GeneaBlogie, Thomas MacEntee at GeneaBloggers, Jay Holladay, Elizabeth O'Neal at Little Bytes of Life, Amy Coffin at We Tree, footnoteMaven (behind me) of FootnoteMaven and Shade of the Deaprted, The Ancestry Insider, Leland Meitzler. Front: Kathryn Doyle CGSL/California Ancestors, Leslie Mehana, Elyse Doerflinger of Elyse's Genealogy Blog, Gini Webb at Ginisology (myself) and Cheryl Palmer of Heritage Happens. Jamboree: Son of Blogger Summit 2009. 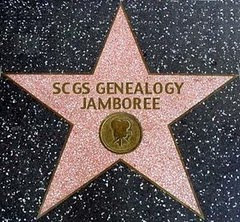 Amy over at We Tree had a wonderful post "The Rock Star's Guide to Genealogy Conferences", to getting organized and ready for the Jamboree, thank you Amy, your post really put things into perspective for me. I feel I am much more prepared, unlike last year! I created a spreadsheet listing the lectures and classes I intend to take and the vendors I want to visit this year. Last year I only had one full day, this year I will be attending all three days so I will get to do and see much more. I know I won't miss seeing Janet Hovorka at Generation Maps and FootnoteMaven's "Shades of the Departed" will be featured on the "TwitterTron"!! It's going to be fun. I am pretty much ready to go. I have my photos and documents ready for my 15 minutes of scanning with Ancestry.com I signed up for. I am almost completely packed with the exception of last minute articles. My laptop will be packed up at the last minute. I am going to try and do some posting, however, there is no guarantee, I may be having too much fun and will leave the posting to when I get back! Camera battery is charged and ready for the many photos I intend to take. Hopefully, I haven't forgotten anything...I will be hitting Randy up over at Genea-Musings, for some of those M & M's, my favorite! Looking forward to seeing you there...and the geneabloggers that are uable to attend this year will be very missed, you all will be with us in spirit. Be seeing you soon, and all of the other bloggers attending too!